The Bridal Solution would like to invite you to a Vendor Happy Hour! We would like to present you this fun opportunity to socialize with other event vendors in mid-MO, network with other experts in the event industry, and of course enjoy happy hour drink prices and complementary appetizers! 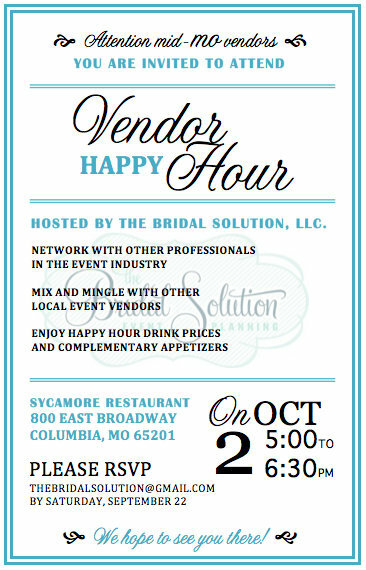 The Vendor Happy Hour will take place at Sycamore Restaurant in Columbia, MO on October 20 from 5:00 to 6:30 pm. Please RSVP to thebridalsolution@gmail.com by September 22, or contact us for more information!